This past weekend I attended a new event in Toronto called “The Toronto Antique & Vintage Market” at the CNE grounds. I was attending on behalf of the Toronto Vintage Society and also for my own pleasure..hello Vintage Shopping! The event was a pretty good size with booths selling everything from vintage clothing to vintage postcards and antique furniture. I had a very limited budget so I knew that I was not going to go all hog-wild on buying things, plus my closet is getting so jammed I really have no space to store any new clothing items until I do a purge (which is going to be almost impossible). So my plan..keep it small and easy to store. 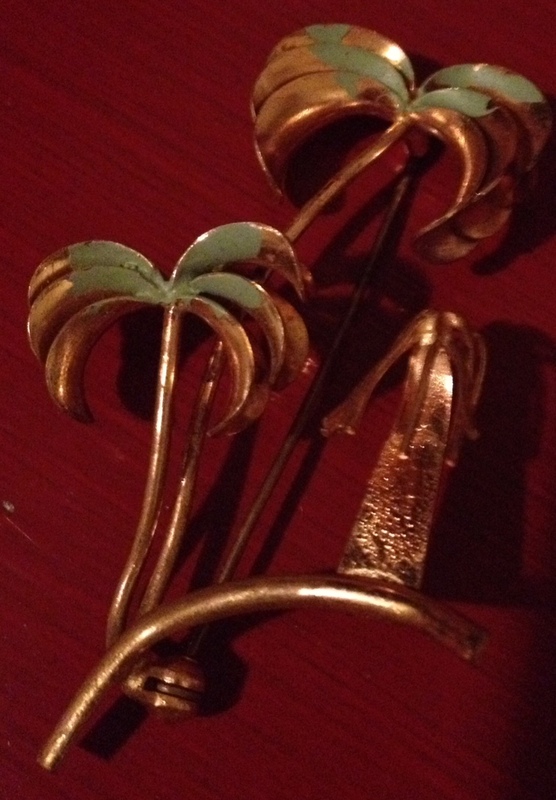 Well the show had lots of that so I scored a few awesome finds, and here is what I found…. 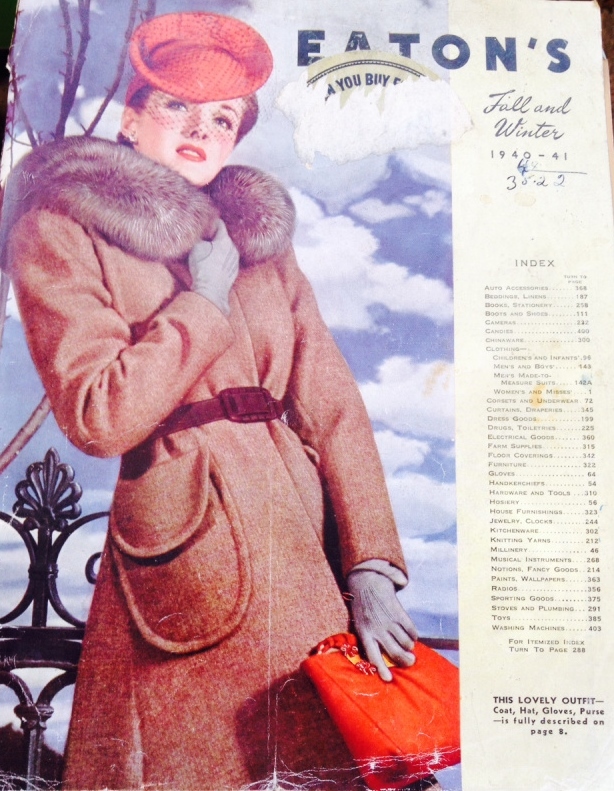 One of my favorite finds from the show-a 1940-41 Fall & Winter Eaton’s Catalogue (stay tuned for a post on all the goodies inside!). Eaton’s was once Canada’s largest department store retailer. It was founded in 1869 in Toronto by Timothy Eaton, and it grew to become a retail and social institution in Canada. With stores across the country, buying offices around the globe, and a catalogue that was found in the homes of most Canadians (we always had one in my home). Sadly in 1999 the company went bankrupt, so now finding pieces of history like this is means just a little bit more for vintage history lovers like me (Source). The jacket is absolutely DIVINE! 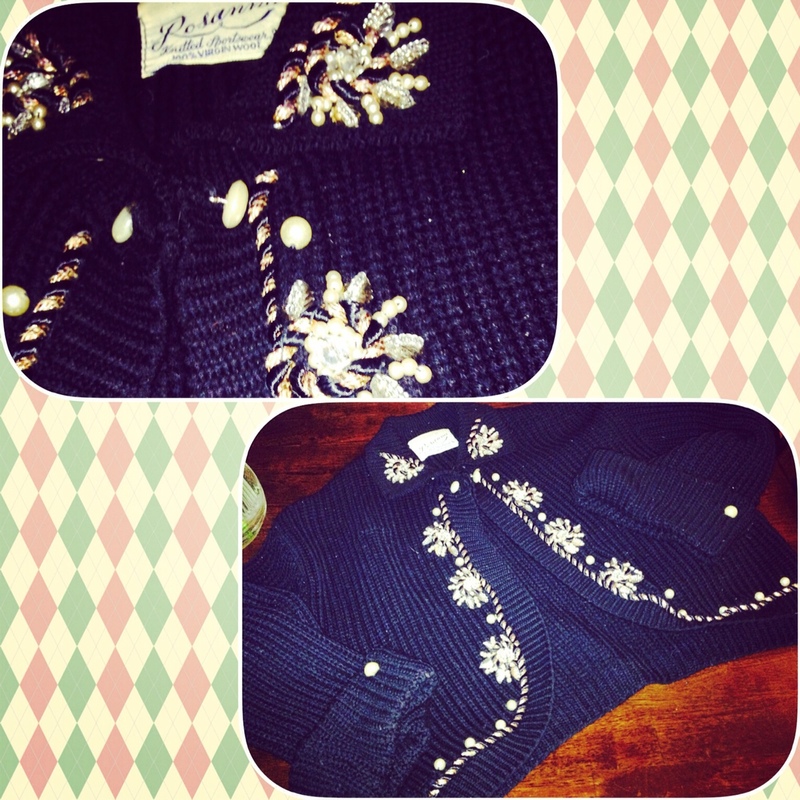 This sweater has the most wonderful details as you can see below and is in MINT condition. I got it for a steal AND it’s small so it will fit in whatever remaining space is left in my closet. The below image has a story to tell and I love it! I believe that the couple is going on their honeymoon or something very important because air travel in the 1940s was not something you just up and did like we do today. Plus they look really really nice, which is nothing out of the norm for air travel in the early days but they just look like it’s a special occasion. 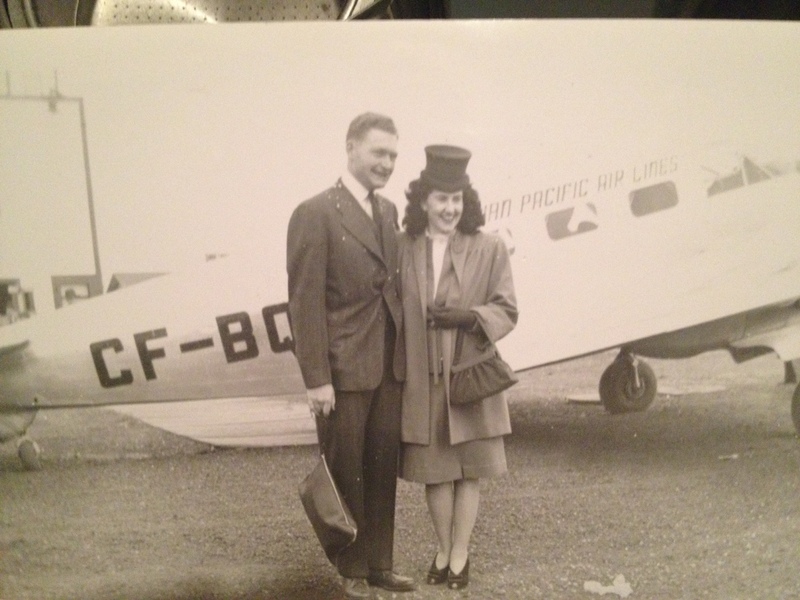 I think it is also great that the plane in the background is actually a Canadian airline (no longer around) called “Canadian Pacific Air Lines“. I love finding images like that this have a bit of Canadian history tied to them. Lastly, lets talk about her outfit. Her hat is just amazing and so very different from what I normally see. She also has great peep toe shoes purse and her classic suit goes a long long way in the “simple but stylish” department. 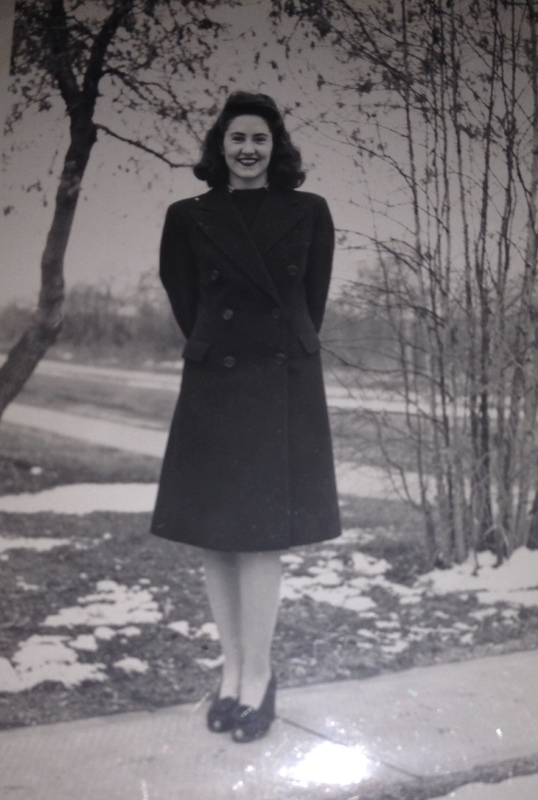 Next up we have this 1940s cutie in a double-breasted winter jacket, that just looks soooo warm! Hopefully warm enough to keep her exposed head and toes warm too. Aren’t her shoes great?! I was drawn to this picture for the simple beauty coming off the paper. 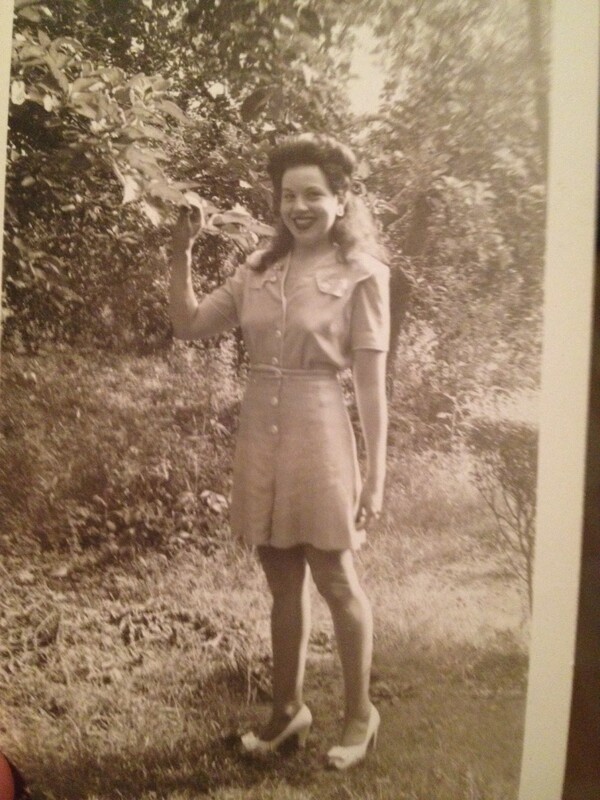 She looks very happy smiling for the camera, and I wonder what her story is? Maybe off to see a loved one return from war? When I saw this picture my girlfriend and I tossed back and forth whether she was wearing a playsuit or not and finally after both agreeing that is was VERY clear that she was, I had to buy it! I am curious on where she is though? Those heels don’t look to easy to walk in for a stroll in the woods. 1940’s Playsuit for the Win! 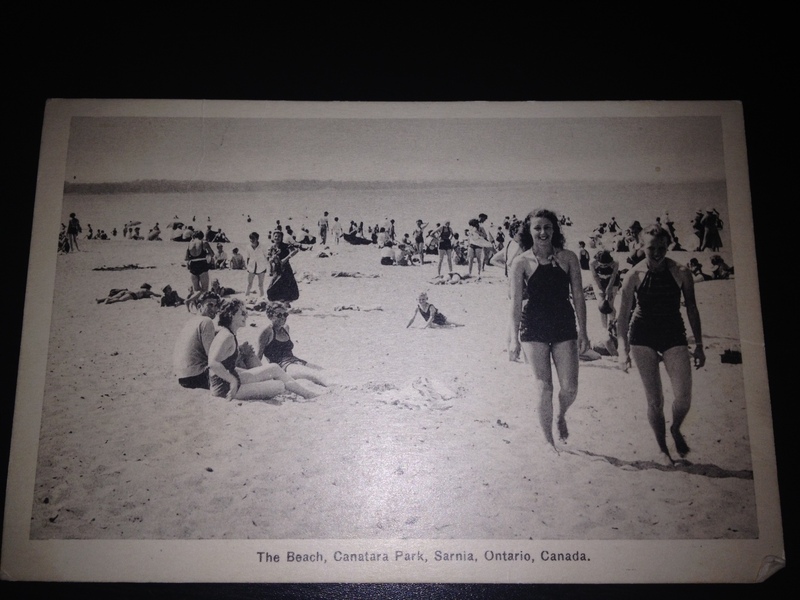 Next up is a early 1940s (maybe late 1930s) beach photo from my hometown of Sarnia, Ontario. The beach was at Canatara Park a frequent hangout for those who wanted to catch some rays and go swimming in Lake Huron. I was super excited to find this picture because I have never really seen any cool “life images” from my hometown. So to stumble upon a postcard with this image was a wonderful surprise for me. I’m totally digging the swimsuits and hair in this photo. 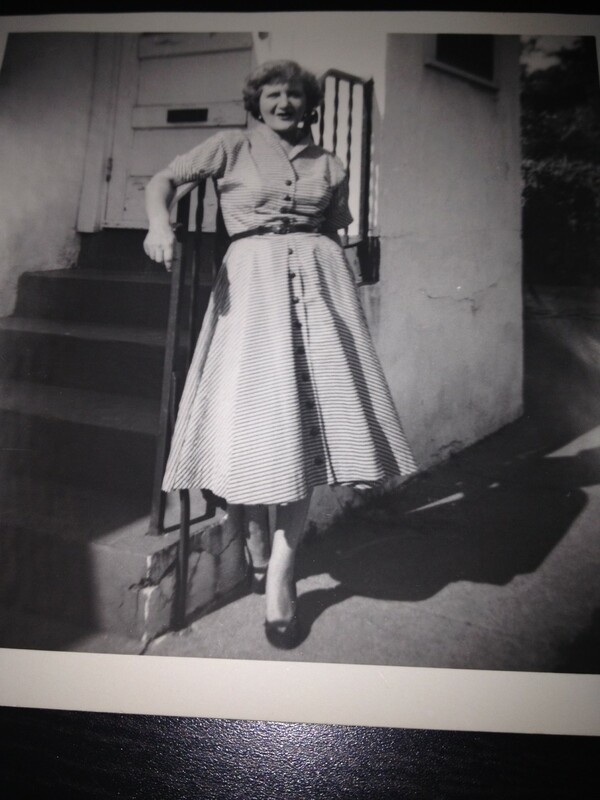 Next up we have the most stylish 1950s Housewife on the block. Lets call her Marge 🙂 Isn’t she just lovely? What colour do you think her dress is? I can’t seem to decide personally. 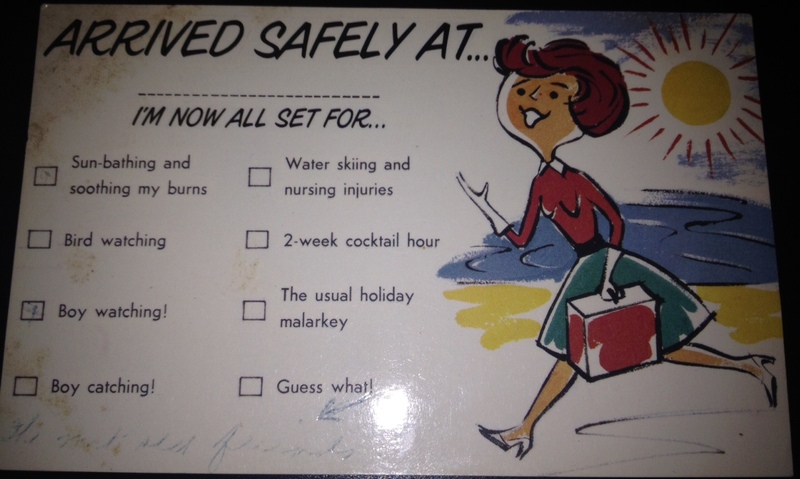 I also found this super funny postcard that from what I can see was mailed in the 1950s (according to the back) from one woman friend to another. Isn’t it hilarious??!! Lastly I did NOT buy this at the show but I had to share it. 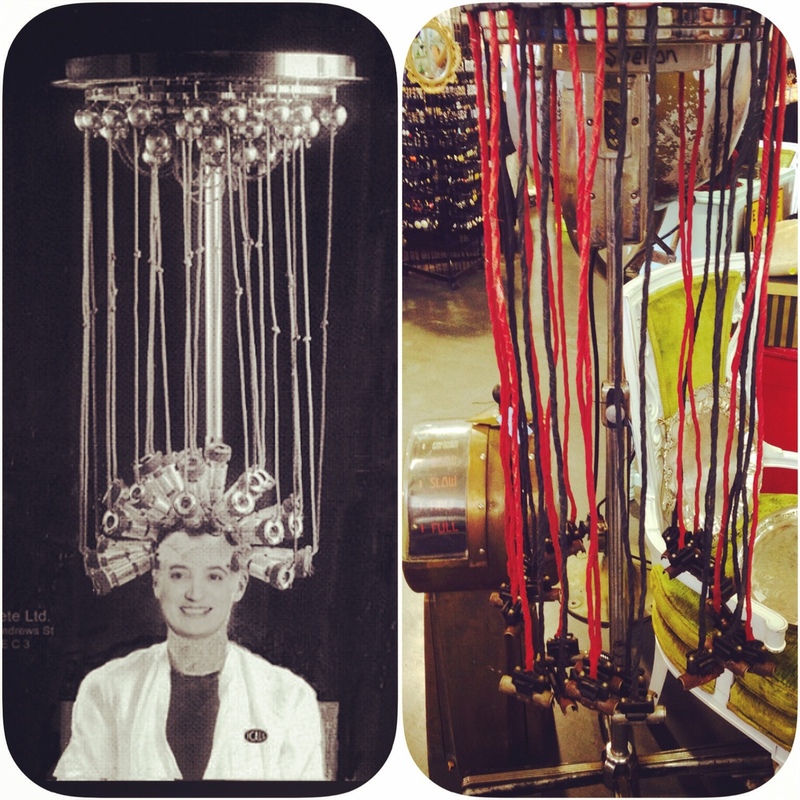 I stumbled upon a 1930s Hair Perming Machine and had to take a picture of it. It was crazy cool and crazy scary at the same time! Can you imagine sticking your head under this thing? And that was my finds friends! Did you do any recent shopping this weekend or week? If so what was your favorite find? What cool stuff you happened upon! 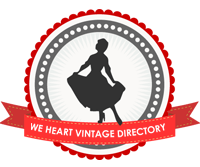 We are too light on vintage fairs and markets here in NYC – we need to get with it! Wow! Great stuff 🙂 That fall/winter outfit from the Eaton’s catalogue is just perfect, but I love all the looks from the photos too. The hat in the honeymoon picture is quite unusual, isn’t it? Looks great though! Ohh pink never thought of that as option. That would be really cute I think. Great suggestion. oh that 40s playsuit in the photo! How cool that we were both at vintage fairs on opposite sides of the country on the very same days! Love the treasures you found! I purchased a few vintage photos at the Victoria Vintage Expo, too. I’m still debating whether I’ll be keeping them or listing them in the shop (maybe 50/50? :)). The vintage world is awesome like that 🙂 Well if you list them I will be checking them out for sure, it’s become my favorite thing to buy right now.